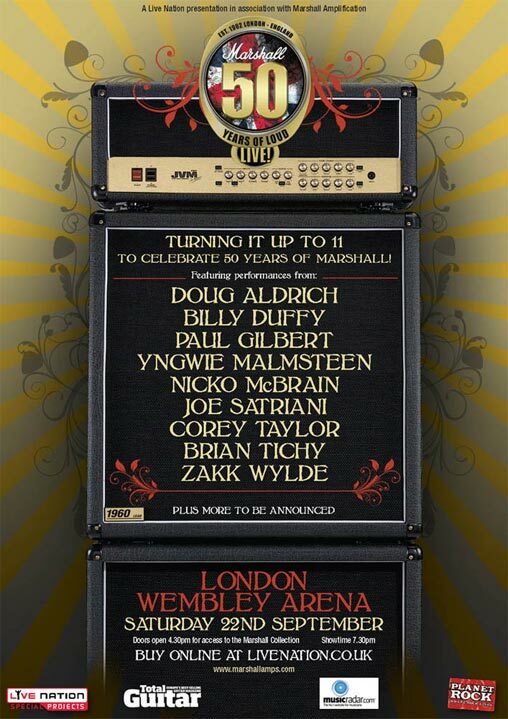 On 22nd September Billy appeared as one of the special guest artists at the Marshall 50 Years of Loud at Wembley Arena, London UK. The concert was a celebration of not only the legendasy amps, but also a tribute to The brand creator Dr. Jim Marshall. Billy was in great company as a whole heap of the world’s top guitarists paid homage to a man that helped them find their sound. The lineup consisted of guitarists Zakk Wylde (Black Label Society), Kerry King (Slayer), Yngwie Malmsteem, Joe Satriani (Solo, Chickenfoot), Doug Aldrich (Whitesnake), Paul Gilbert (Racer X, Mr. Big), Phil Campbell (Motorhead), drummers Nicko McBrain (Iron Maiden), and Mike Portnoy (Adrenaline Mob), bassists Glenn Hughes (Solo, Black Country Communion), Andy Fraser (Free), and vocalists Corey Taylor (Slipknot, Stone Sour), and Tim Ripper Owens (Dio Disciples, Yngwie Malsmteem) with the house band of Musical Director and guitarist Chris George, powerhouse drummer Brian Tichy (Whitesnake, Foreigner) Adam Wakeman (Ozzy Osbourne, Black Sabbath)- keys, and Jaz Lockerie – Bass. Holding the whole proceedings together were hosts British comedian Al Murray and drumming legend Nicko McBrian. It was down to Billy to open up the show as he performed alongside Slipknot’s Corey Taylor with storming versions on The Cult’s Lil’ Devil and Love Removal Machine. These went down amazingly and got the crowd in the mood for an evening of Rock n Roll turned up to 11!